Heading off to college is an exciting time in life. Both undergraduate and graduate degrees beckon and most college graduates make more than $50,000 a year right out of school, illustrating why having a college degree is so important. However, college also has an expensive price tag. Almost everyone has some form of student debt when they graduate. But the good news is you’re not limited to just one lender as you grapple with the loan payback process. Two solid options are CommonBond and LendKey but which one is best? CommonBond is the brainchild of three MBA students from the Wharton School of the University of Pennsylvania. They built a lending company that offers highly competitive rates and supports both private funding and refinancing options. In contrast, LendKey is a platform where students are connected with multiple lenders for their loan needs. The lenders are smaller institutions, such as local banks and credit unions. Both private loans and refinancing choices are available through LendKey. Undergraduate, graduate, and MBA students are welcome to choose between direct or private loans as well as refinancing options for their current obligations. Because CommonBond’s founders had student debt themselves, they understand the importance of refinancing multiple loans. A CommonBond loan can be used for federal PLUS loans, undergraduate debt, and graduate school obligations. One payment versus numerous bills from many lenders each month is the big perk when you choose this option. If you have good credit and a financial need, CommonBond’s private loans are generally among the lowest interest rate options on the market. More than $100,000 is available for your schooling. Plus, you have the option of paying back the loan while you’re in school or afterwards. LendKey offers direct or private loans with its refinancing options. Although LendKey services the loans, borrowers should be aware that the funds are held by other financial entities. Small lending institutions reap the bulk of the interest rate rewards payments when you diligently make payments. When you refinance with LendKey, several banks compete for your business. This platform is known for its associations with borrowers who make less than $100,000 a year. Flexible terms may be available from various lenders. But you’ll need to read over the fine print before making a decision. LendKey works exclusively with undergraduates on its private loans. With several available grace periods and forbearance options, borrowers may enjoy some flexibility when choosing among these lending options. Each loan undergoes a “qualifying process” where credit unions and small institutions compete. 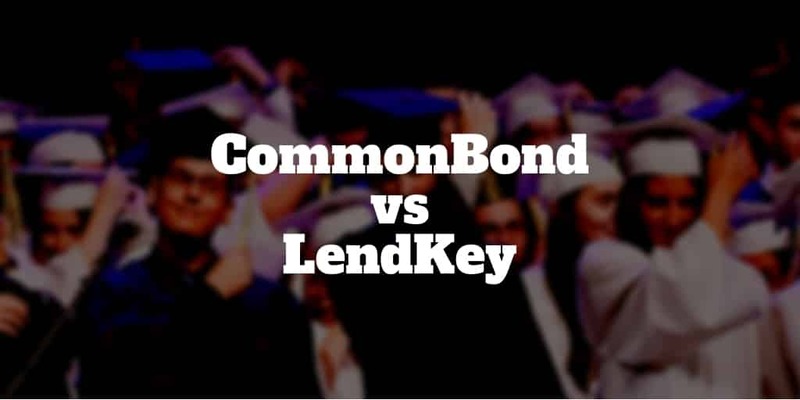 Both LendKey and CommonBond are competitive when it comes to loan rates. Your credit score and credit history are considered. And as with most loans, variable rates are usually lower than fixed types. For borrowers who are uncomfortable with the risk of monthly payment obligations changing as interest rates fluctuate, fixed rate loans may be a better fit. CommonBond fixed rates for undergraduate student loans start at 5.3%. Compare these rates to their refinancing options, which start at 3.2%. Similarly, at LendKey the refinancing rates are lower than the private student loan rates. You may also qualify for a rate discount of 0.25% when you sign up for automatic withdrawals. Variable rates depend on the federal prime rate plus a percentage tacked on by the lender. CommonBond’s current rates for private loans start at 3.87%. If you choose to refinance your loans, the rates begin at 2.55%. Similarly, LendKey refinancing interest rates on variable loans will be lower than those for private student loans. A hybrid loan product has a fixed rate early in the loan term, but it converts into a variable loan near the end of the term. CommonBond only extends a hybrid loan to its refinancing customers. Hybrid rates begin at 4.32%. LendKey doesn’t offer hybrid rate loans. You’ll only find traditional fixed and variable rates with LendKey. Fee charges can stack up over time if you’re not careful so finding lenders who keep fees to a minimum is important over the long term. CommonBond frees students from origination fees when they choose to refinance. Be aware, however, that 2% of your private student loans is charged as origination fees. If you plan on borrowing a large sum, this percentage can be pricey. LendKey charges no origination fees on either private or refinanced loans. Neither provider charges prepayment penalties and both encourage responsible debt management by making it possible to pay off your loan early if it is affordable to do so. Borrowers are responsible for the payments on their loans, and both providers charge late fees. CommonBond charge 5% of the due amount or $10 fee if you pay late. The grace period is 10 days. LendKey has variable late fees because each provider has its own regulations. Late fees currently range from $5 to $15 per each occurrence. Grace periods also vary. The new crop of lenders, like CommonBond, Earnest, and SoFi, offer perks that borrowers probably never enjoyed a few decades ago. When you choose CommonBond for your financial needs, the lender turns to a nonprofit organization called Pencils of Promise. Pay back your loan as dictated by the terms, and CommonBond extends funds to a needy child. His or her education becomes a reality with your regular payment schedule. Most consumers look toward big banks and conglomerates for their loans but LendKey gives community banks and credit unions a platform so they can be more visible to the public. Supporting small banks and credit unions indirectly has the potential to support surrounding communities too. Term lengths are identical whether you choose CommonBond or LendKey. Both providers offer 5, 7, 10, 15, and 20 years to pay off either fixed or variable loans. However, they differ when it comes to private loans. LendKey only has a 10-year term for fixed and variable rates. However, you can select among 5-, 10-, or 15-year terms for CommonBond’s products. When it comes to CommonBond’s hybrid loan, the only option is a 10-year term. The rate for half of the term is fixed, and the second half comes with a variable rate. CommonBond requires a co-signer on loans. There’s no way to get around this requirement. However, it is possible to release a co-signer after two or three years if you have a history of on-time payments. A credit score of 670 or higher is required on private loans. Refinancing with CommonBond requires you to jump a higher hurdle; a 750+ credit score is necessary. It’s probably safe to say that refinancing with CommonBond is harder than obtaining a private loan and the lender prefers super-prime borrowers. LendKey is a bit more relaxed when it comes to eligibility criteria. It knows that not everyone will be a six-figure professional. You’ll need a credit score of about 660 or above. Applicants must make at least $24,000 per year. If you use a co-signer, the salary requirement drops to around $12,000. Bankruptcies don’t lead to automatic denials, either. Depending on the financial product, a bankruptcy on file may be fine as long as the filing occurred between five and seven years ago. For most applicants, filling out the online form is the easiest route to get started with CommonBond. You can choose from three loan types or select refinancing. Each loan application is geared toward a specific lending product. You’ll need your basic information ready when you apply. An assigned loan officer will contact you with additional details later on. The entire process from start to finish is highly streamlined so you shouldn’t find yourself getting lost along the way. LendKey operates in a different fashion. You can pre-apply for rates that are personalized to your needs. It performs a soft check on your credit, but it doesn’t ding your score at all. You can end up with several offers from the soft check. Choose the most attractive one, and apply through the website. Applicants will hear from that individual lender as the process moves forward. Admittedly, it’s a bit of a commitment on your part before you have any solid figures. If you want to work with a single provider with a moral compass, CommonBond is a spectacular choice for students. Professionals who are looking for a wide variety of options will do well with LendKey. The platform connects you with credit unions and local banks that may have some flexibility with their terms. With every offer, read over the details regarding interest rates and term lengths. There’s a loan built just for you with either platform. From co-signer requirements to payback options, both CommonBond and LendKey offer distinct value for your loan dollar. Every person is unique, and your loan options should reflect that. Secure a private or refinanced loan today, and you can concentrate on a successful career tomorrow.